Students from BSA and RASA hosted a mixer for incoming freshmen in Farnsworth Pavilion. 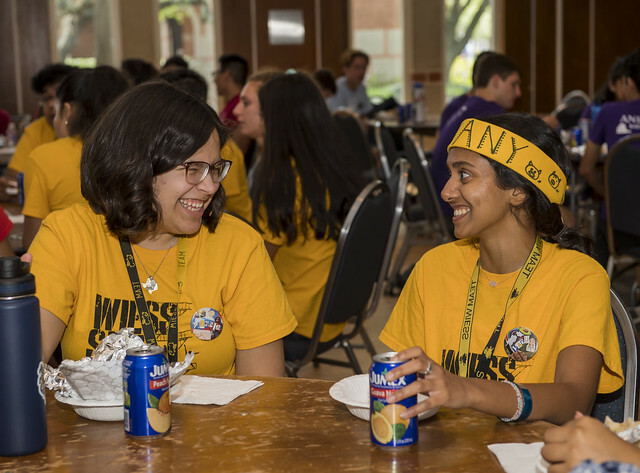 The newest class of Rice students was invited to attend affinity group meetings in the Rice Memorial Center during lunch Aug. 14. The Hispanic Association for Cultural Enrichment at Rice treated a host of incoming freshmen to tacos in the Grand Hall, and the Muslim Student Association showed students the campus prayer room in the adjacent Rice Memorial Chapel after enjoying their own taco buffet. Houston Hillel, which serves Jewish students and young professionals on campus, welcomed students in the Miner Lounge alongside Rabbi Shmuli Slonim of Chabad at Rice University. Rice Queers and Allies hosted a mixer in the Rice Multicultural Center, while the Rice African Student Association and Black Student Association teamed up to pack Farnsworth Pavilion for an ice-breaker session.